Latin inscriptions are fascinating. Like personal letters of the same time, they allow unique glimpses into the ancient world and the fate of individuals – if, in the case of tombstones, usually through the prism of the perception of those who lived to inscribe a story rather than necessarily those who experienced them. How annoying therefore, when a text that has the word ‘fascinating’ written all over it, withstands any attempt to elicit relevant information at a crucial point. A most remarkable case in that respect is an inscription from Heba (Magliano) – near Grosseto – in Etruria. Lucius Al(l)ius, son of Gaius, age in years 25, has died […] for he tried to stand up against the allegations against him. The Al(l)iae, daughters of Gaius, had this (monument) made. A crucial element, right in the centre of the inscription – at the beginning of the middle line – remains unclear. The text reads VEVENE, without any indication of word division (which is present in all other cases). The passage in question has, of course, already attracted a certain amount of academic interest. An early editor has tried to explain ve-bene as ‘less good’, creating thus both a new (and implausible) word and a sense that does not really check out with the overall diction of the text. Heikki Solin, in turn, has tried to explain the phrase either as v(a)e ven(a)e ‘woe is the vein’ (with monophthongization of the ae diphthong, as common in Latin – the phrase being a reference to cutting open one’s blood vessels in a suicide attempt) or, preferably, as ve⌈n⌉en⌈o⌉ ‘by means of poison’ (with two misspellings in an inscription that otherwise does not show such features). Solin’s ideas of suicide or, alternatively, of murder by poison, originally published in Arctos 15 (1981), has been widely accepted, and perhaps rightly so: the imperfect tense of defendebat suggests a drawn-out attempt of the deceased to defend himself – an event that is eternally linked to his death, whether self-inflicted or brought upon L. Al(l)ius. Unlike as is fairly common in Republican inscriptions, the first line does not stick out to the left: instead, the whole inscription, in its arrangement, is aligned to the left. Moreover, the word division between the deceased’s first name, L(ucius), and his family name, Al(l)ius, is strangely inserted in the space reserved for the L.
Even though otherwise the letter E is consistently spelled as E, it appears – twice (and for no obvious reason) – in its cursive spelling II in de|fendebat in lines 5–6. Incidentally, de|fendebat also provides the only instance of word division over two lines in this inscription – unnecessary, as the whole text could have been arranged with defendebat in line 6, while bumping the names of the relatives, the Al(l)ias, to the final line. Could it be the case that these oddities carry meaning? L – A – X – V – S – F – C.
This could – tentatively – be read as L(ucius) Axus f(aciendum) c(uravit), ‘Lucius Axus took care of that’. Axus is a rare, yet not altogether unattested name – though one may be surprised to find it relatively early in this region. If this observation is correct (and it is little more than mere speculation! ), then one may take this observation as a hidden allegation, potentially supporting the theory that Al(l)ius’ death was perhaps not self-inflicted after all. Hospes paullisper morare | si non est molestum et quid euites | cognosce amicum hunc quem | speraueram mi esse ab eo mihi accusato|res subiecti et iudicia instaurata deis | gratias ago et meae innocentiae omni | molestia liberatus sum qui nostrum mentitur | eum nec Di Penates nec inferi recipiant. Stranger, delay a brief while if it is not troublesome, and learn what to avoid. This man whom I had hoped was my friend, I am forsaking: a case was maliciously brought against me; I was charged and legal proceedings were instituted; I give thanks to the gods and to my innocence, I was freed from all distress. May neither the household gods nor the gods below receive the one who misrepresented our affairs. In Phileros’ case, the name of the wrongdoer may possibly be inferred from the context. 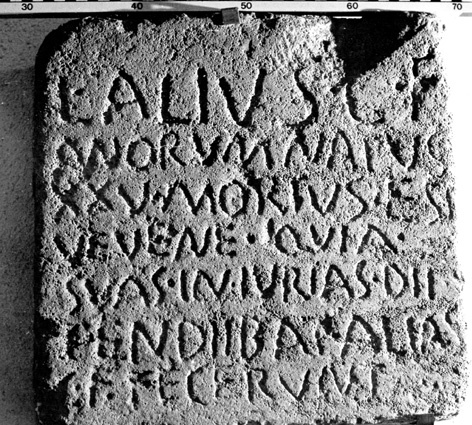 Naming and shaming through a hidden message, however, as potentially seen in the Al(l)ius inscription, would be something rather different. This entry was posted in Epigraphy, Prose and tagged Death, Latin Inscriptions. Bookmark the permalink.